To deliver true reality in the reproduction of music, an audio cable needs to display a high level of fast transient response and limitless dynamic range, without loss of minute information, and to deliver the important "feel" of the music. With world leading technology in raw conductive material and accumulated know how in cable design, as seen in ots 7N-A2070 and other products, Acrolink proudly introduces this new reference standard. Conductive cores are made from high purity 6N copper and insulators are of high polymer polyolefin for the lowest dielectric constant factor. Being designed as 2 core balanced cable, the 2 centre cores are covered further with a newly developed sheath material which is high polymer polyolefin with amorphous metal granules mixed-in to suppress unwanted vibration, and for ideal EMI absorption. Acrolink has also developed new connector plugs of the highest quality. There is a choice of unbalanced RCA and balanced XLR for the 6N-A2400 II. 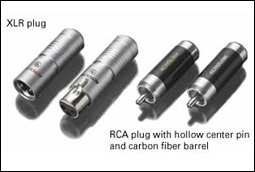 RCA plug: the main body is precision machined out of iron free phosphor bronze for the most secure contact with long life. The center pin is hollow to increase surface area and plated directly with extra thick rhodium. The carbon fiber outer case absorbs EMI disturbance and also further suppresses resonance. XLR plugs: the main body is precision machined out of solid brass to suppress contact resonance with its super heavy weight. Contacting pins and sleeves are made from phosphor bronze and rhodium plated directly.The outer cover is also machined out of solid brass.